Sufism is Islamic mysticism. It is not a separate confession or a sect. Sufism is a mystical current within Islam, expressed in various forms ranging from philosophical meditation and symbolical poetry to ecstatic rituals. There are also different levels of commitment: some people are strongly devoted to following the mystical path and frequent meetings of a Sufi brotherhood (tariqa) lead by a sheikh, the spiritual guide of the brotherhood. But many more are more generally sympathetic to Sufi spirituality without being active members of a brotherhood. 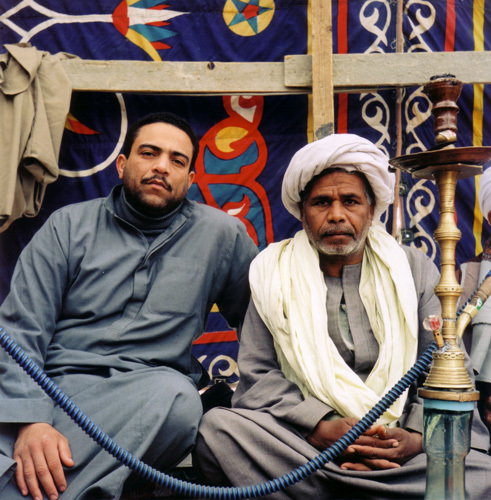 The image of Sufis in modern Egyptian media is often that they are simple, ignorant peasants. This image not true, however: many Sufis are well educated and and have profound knowledge of their religion. The reason for this one-sided perception is that Salafi critics of Sufis try to delegitimise them by calling them ignorants. But the appearance of Sufis at mawlids also plays a role. People from the middle classes who otherwise might wear a suit put on a traditional dress when they go to a mawlid, as a symbol of commitment to tradition and collective unity beyond class differences. For example Muhammad and sheikh Abdallah, both devoted Sufis and members of the Shadhiliya brotherhood, are well-educated and work as accountants in a bank.